Introducing the Hand Skeleton by 3B Scientific. It is a functional bone model brought to you the industry’s distinguished company based in Germany renowned in the field of manufacturing and distributing high-quality anatomical models and charts that are a brand of choice amongst universities, hospitals, and medical offices. Study of the human hand is significant to anatomy and physiology. These anatomical models are distinctively used as educational teaching materials for medical and scientific purposes. It is a great addition to any anatomical classroom or medical office. The bones of the hand skeleton are woven loosely on a nylon thread to easily display articulation and movement. The two hands combined are designed for a multitude of functions ranging from basic movements such as holding objects to complex activities like painting, writing, etc. 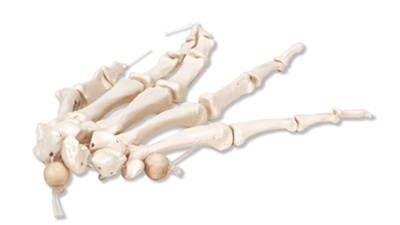 This realistic life-sized replica of the hand skeleton is naturally cast from a human hand bone specimen. The bones are made of high-grade durable plastic that is non-corrosive and is sure to last for many years. FUNCTIONAL- The bones of the hand skeleton are woven loosely on a nylon thread to easily display articulation and movement. EDUCATIONAL- These anatomical models are distinctively used as educational teaching materials for medical and scientific purposes. It is a great addition to any anatomical classroom or medical office. REALISTIC- This realistic life-sized replica of the hand skeleton is naturally cast from a human hand bone specimen.